"I think participation in this theater program helped me to feel a little less like a medical student, and a little more like a human being again. And that's a very good thing." "I thought this program embraced the world of medicine with humor, reflection, and empathy. It showed me that fellow medical students and physicians struggle with common issues that our training fails to teach, and that we have to simply learn by experience. A definite highlight of my first year." "I feel very grateful to have been able to be a part of this class. It opened my eyes to a new way to think about things while also allowing me to have fun and relax in a life that otherwise can be very stressful." "I think the process of writing and acting helped me process a lot of the hurt and pain I see every day in the hospital. It also helped me feel good about the work I do and gave me permission to simply be me." Lantern Theater Company is partnering with the Sidney Kimmel Medical College (SKMC) of Thomas Jefferson University to create an introduction to drama, acting, and playwriting for students of health professions, residents, and Jefferson faculty. Conceived by Salvatore Mangione, M.D., pulmonologist and director of physical diagnosis-clinical skills at SKMC, and the Lantern's artistic director, Charles McMahon, this innovative program seeks to foster empathy and tolerance for ambiguity among health professions students using the tools and techniques of the theatrical form. According to McMahon: "The Lantern has long held the belief that theater should enrich the life of its community by providing people with unique experiences and uncommon perspectives that help us to create greater context and meaning in our lives. This collaboration with Thomas Jefferson University has the potential to open up new ways our respective fields can enrich each other." Funded by The Josiah Macy Jr. Foundation and IMAP, the drama program officially kicked off in November 2014 and is part of a larger humanities curriculum now required for first-year medical students at SKMC. Dr. Mangione was particularly interested in theater as a tool to foster empathy. "Theater is not entertainment," Dr. Mangione said. "The Greeks created drama to be catharsis by proxy. It is a tool to understand the human condition." Lantern teaching artists lead students and healthcare professionals in workshops that explore a variety of acting and playwriting techniques. The program culminates in a live presentation, performed by an ensemble of Lantern artists and program participants for an audience of students, staff, and community members, including The Operating Theater in 2017, The Truth Beneath: Five Stories You Haven't Heard From Your Provider in 2016, and Funny, Sad, True and Mad: A Theatrical Exploration of the Medical Life in 2015. The next phase of the program will begin in 2018. Stay tuned for more information! Questions? Please contact M. Craig Getting, Education Director, at cgetting@lanterntheater.org or 215.829.9002 x104. 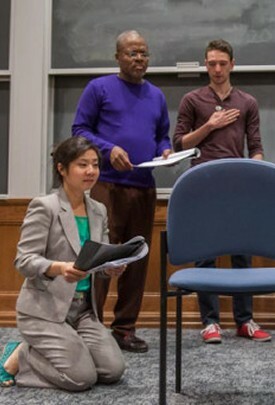 Pictured (above left): Actors Bi Jean Ngo, Kirk Wendell Brown, and Trevor William Fayle work with participants in the Lantern/SKMC partnership (May 2015). Photo: Thomas Jefferson University Hospital.